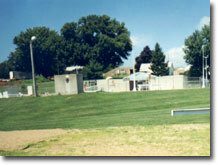 The Norman D. Stamp Aquatic Center is the jewel of the over 84 acres of Harlan parks. It's season runs from Memorial Day all the way to Labor Day. Young and old will have a great time with it's HUGE water slide, 8 lanes and safe environment. Our aquatic environment includes a large six-lane indoor pool, complete with easily accessible stairs. Also featured is our climate-controlled Sauna and our warm, relaxing Spa with hydro jets. A trip outside leads you to the Children's Activity Pool with a Frog Water Slide, a fountain and five bubbly Geysers. Walk across our spacious sun deck to experience our two 150-foot Water Slides . The slides plunge into a roomy pool that waterfalls into our beach area which slopes down to our swimming area and diving boards. Take a break from the water and enjoy our 18 hole miniature golf course or sand volleyball court. We are handicap accessible and there are always Certified Life Guards on duty.